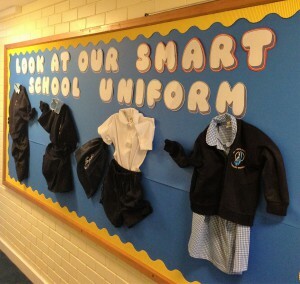 St Mary’s pupils are recognised by their uniform and it is important that they wear it correctly so that they look smart for school. Plain white T-shirt and navy shorts. Plimsolls are needed for indoor games and trainers for junior football and other outdoor games. Dance and gymnastics will be performed in bare feet. Swimming trunks or a one-piece costume is needed in Year 3 and plain navy blue tracksuit bottoms. Footwear should be appropriate for school and this means no heels as children could injure themselves. Boots (including ankle or knee-high boots) are not part of the school uniform and should not be worn.